BUFFALO – When Chad Johnson hit free agency last summer, the goalie said he could’ve pursued opportunities to join teams much better than the Sabres. Ultimately, Johnson said his heart led to him re-signing here as a backup following a season with his hometown Calgary Flames, tonight’s opponent at KeyBank Center. Johnson, 31, said he trusted new Sabres general manager Jason Botterill and the organization. Of course, the Sabres, despite their current 7-5-1 run, have been perhaps the NHL’s biggest disappointment, winning only 21 of their first 66 games. Johnson, meanwhile, endured a brutal start, going more than three months without a win. “I’m not happy with how the season’s gone and how things have played out,” said Johnson, who will start tonight’s game. But Johnson began turning his season around Jan. 22 in Calgary, making 32 saves in a 2-1 overtime win. The confidence his first victory since Oct. 15 generated helped buoy him. Since then, Johnson has been one of the NHL’s best goalies, going 6-2-0 with a 2.05 goals-against average and a .933 save percentage in 10 games. Among netminders with seven or more appearances over that stretch, Johnson’s goals-against average and save percentage both rank fifth. He has also won three straight starts. Before that Calgary win, Johnson had compiled downright awful numbers – 1-8-3, 3.84 and .877 – in 17 contests. Throughout his struggles, Johnson insisted he felt fine and would keep the same approach, something Sabres goalie coach Andrew Allen echoed. His teammates, Johnson said, have been the biggest factors in turning around his miserable campaign. “The way things were going on in the games, they’re completely different from what’s going on in front of me now and that’s why you’re seeing the results,” Johnson said. Johnson said the Sabres have stopped giving up premium scoring chances. “We’re not giving up two-on-ones, getting back-doored, giving up tons of deflections that are going in four times a game,” he said. “We’re not giving up three-on-twos with a guy coming with tons of speed down the middle and getting a clear-cut shot. Johnson said the Sabres are reacting to plays instead of thinking. “That creates more space for me to see the puck,” he said. Sabres coach Phil Housley believes Johnson has been showcasing a new level with his teammates. “Let’s make no mistake, Chad has really given us some key saves at key moments in games,” he said. “He’s really stepped up his game, you can really see it in the results the last games he’s played. With Johnson playing so well again, it’s fair to wonder if he could return next season. Remember, he was terrific two years ago subbing for injured goalie Robin Lehner, compiling a .920 save percentage in 45 outings and earning the team’s unsung hero award. Johnson wouldn’t speculate much on his future. Still, he could have one in Buffalo. 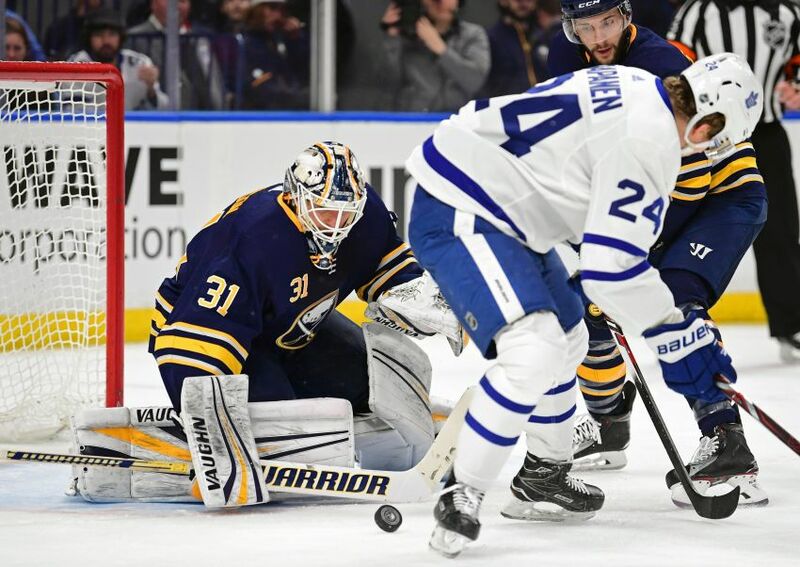 Whether or not Lehner returns – he’s a restricted free agent and could be moved with prospect Linus Ullmark ready for NHL duty – the Sabres will need a backup. Johnson seems to have returned to his stellar form of a couple of years ago ! I see him as more consistent than Lehner! He should be retained and be our main man between the pipes ! Marlies and Amerks heading to overtime.